The Ho Chi Minh Communist Youth Union and the Ministry of Education and Training yesterday held a ceremony to honor exemplary teachers who are working in islands as per the program “Sharing with teacher” 2016. Among honoring teachers at the meeting is Ms. Nguyen Thi Hoi, born in 1966, who is teaching in junior high school in Sen village in island district Van Don of the northern province of Quang Ninh. She has worked there for in 29 years seven months. A representative from the Communist Youth Union highly appreciated teachers’ devotion in islands, appraising teachers who have overcome their difficulties to contribute to the education sector. Teachers were awarded certificates of merit, medals and bank account of VND10 million from the Youth Union. 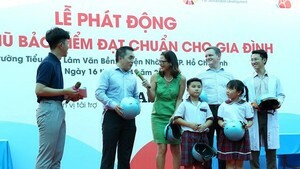 Additionally, Thien Long group promised to give studying items to students in islands nationwide.